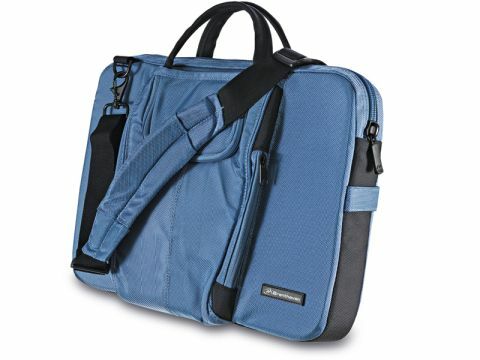 The Brenthaven Metrolite is an excellent bag for a 15-inch laptop. It has plenty of space for accessories and documents in addition to the main laptop compartment, which, typically for a Brenthaven bag, is well-padded and lined. The front-facing pouch unzips to reveal multiple smaller compartments and pockets inside. There's a special pocket with cable hole for placing an iPod, and a see-through plastic cover for placing cards. On the reverse is a zip lock document pouch that will hold A4 documents. The main compartment has stiffened areas all around, including the base and top, and two large strips of felt-lined stuffing that fold down over the laptop from above. The carry handles are great, and you can carry it by hand or with a (removable) shoulder strap. Brenthaven puts a lot of thought into its products, and has nailed another good design with this Metrolite release.